Public Kitchen Supply's selection of hand dryers are among the most energy-efficient hand dryers on the market. We work with businesses like World Dryer. World Dryer offers SMARTdri hand dryers. SMARTdri hand dryers have an antimicrobial technology to keep your hands as clean as possible. Clean hands are extremely important, they are the best way to prevent the spread of disease. Thoroughly drying hands are a crucial part of hand drying, its just as important as washing them. Most micro-organisms are transmitted by moist hands, dry hands dramatically reduce this number to virtually 0. 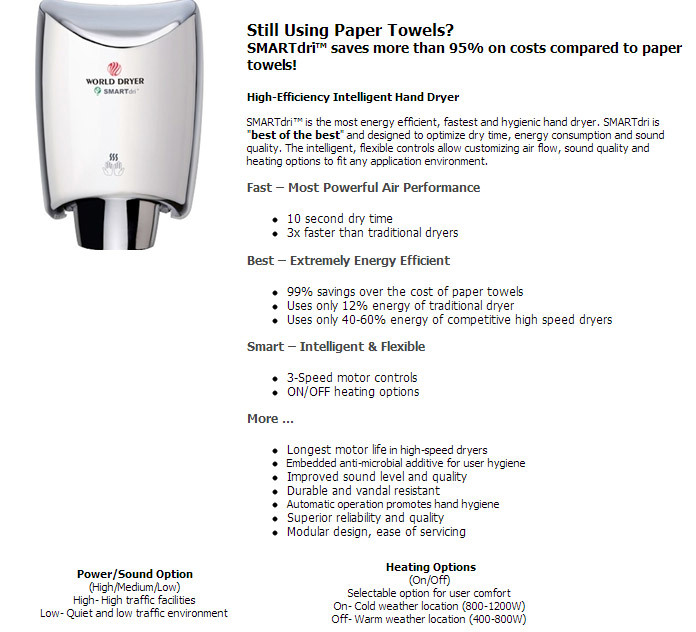 Another benefit of SMARTdri hand dryers is that they are economically and environmentally friendly. Hand dryers are estimated to use only 12% of the energy of traditional dryers. Hand dryers will help you save in so many ways. Most of our hand dryers are made of either aluminum or steel casing to give your restroom a contemporary look. Hand dryers require very little maintenance. You will not have to restock automatic hand dryers. Public Kitchen Supply's Hand Dryers Category offers hand dryers that vary in price, style and function. Choose between products like World Dryers Silver V-Max Hand Dryer. The Silver V-Max Hand Dryer uses antimicrobial technology. This hand dryer uses infrared technology allowing for automatic activation. This hand dryer takes only 10 to 12 seconds to thoroughly dry hands. If yours looking for a simpler, less expensive hand dryer choose World Dryers Aluminum Electric Aire Rounded Hand Dryer. This hand dryer is thermally-protected, it uses a universal brush type motor. In Public Kitchen Supply's Hand Dryers category you are sure to find a hand dryer that fits your business needs.